Bellafill® is an injectable filler that’s FDA approved to treat nasolabial folds (or smile lines) and certain types of acne scars. While other dermal fillers simply fill in hollow areas, Bellafill® fills and lifts to renew your face, providing instant smoothness with long-lasting results. Smooth collagen gel (80%) forms the base of Bellafill®, creating smooth, supple volume to depressed scars or beneath the surface of the nasolabial folds. Polymethyl methacrylate (PMMA) microspheres (20%) are suspended within the collagen gel. These form a sturdy scaffold where your own natural collagen grows. Thanks to these two innovative components, Bellafill® creates instant results that you can enjoy as soon as you leave the office. As the original collagen gel fades away, your body naturally replaces it with your own collagen around the microspheres, for unparalleled long-term smoothness. Bellafill® is indicated for the correction of nasolabial folds and moderate to severe, atrophic, distensible facial acne scars on the cheek in patients over the age of 21 years. Patients who have had a positive reaction to the Bellafill® Skin Test, have a history of severe allergies, have known bovine collagen allergies, are allergic to lidocaine, have bleeding disorders or are prone to thick scar formation and/or excessive scarring should not receive Bellafill®. The safety of Bellafill® for use during pregnancy, breastfeeding, or in patients under 21 has not been established. Based on the 5-year Post-Approval Study on nasolabial folds with 1,008 patients, long-term safety of Bellafill® for up to 5 years has been established. Although your acne may be long gone, its scars can hang around. 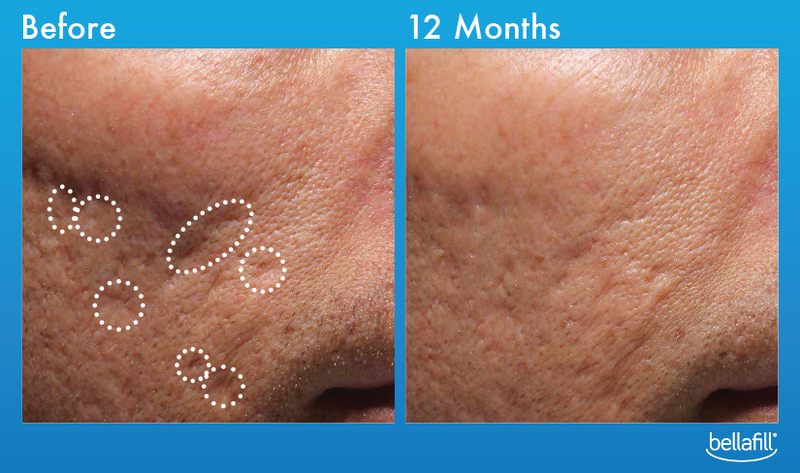 Bellafill® fades these scars by adding volume to them, bringing them to the level of the surrounding skin and keeping them there through 1 year. Bellafill® is the first and only injectable filler that's FDA approved to treat acne scars. 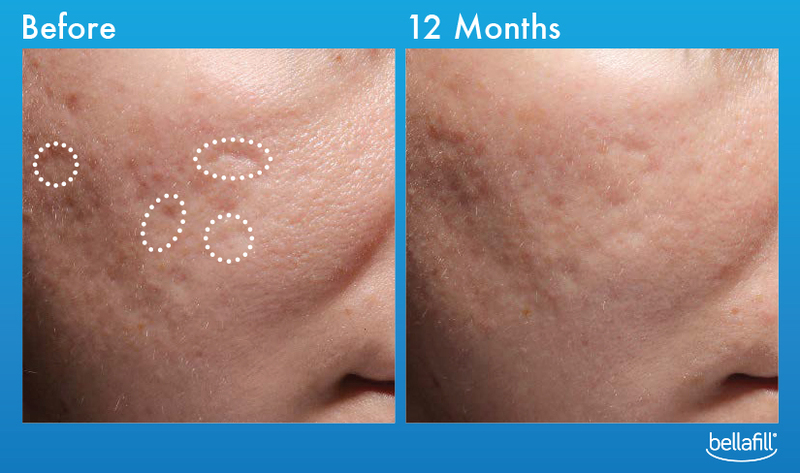 Bellafill® reduces the look of acne scars in 2 ways. Its remarkably small polymethylmethacrylate (PMMA) microspheres are suspended in a smooth collagen gel. The diameter of each microsphere is less than that of a human hair, so they're not visible to the naked eye. Once injected by your practitioner, Bellafill® provides an immediate improvement that you can enjoy as soon as you leave the office. The PMMA microspheres form a supportive scaffold to allow your own collagen to build upon. As the gel breaks down over time, your collagen forms a foundation that adds volume to the acne scars providing a sustained improvement that can last. Want smooth, stress-free skin for a year? Bellafill® can make it happen. How long does it last? How frequently do I need treatments? This dermal filler lasts longer than its many competitors. 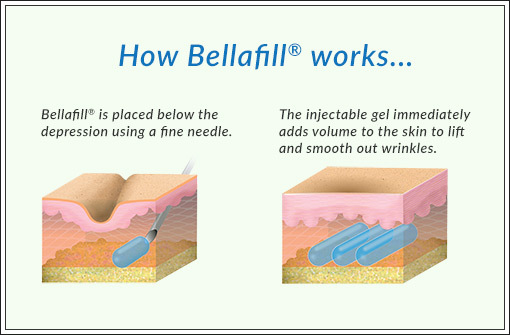 Unlike fillers that only last for a few months to a year; Bellafill® lasts up to 5 years* for nasolabial folds. 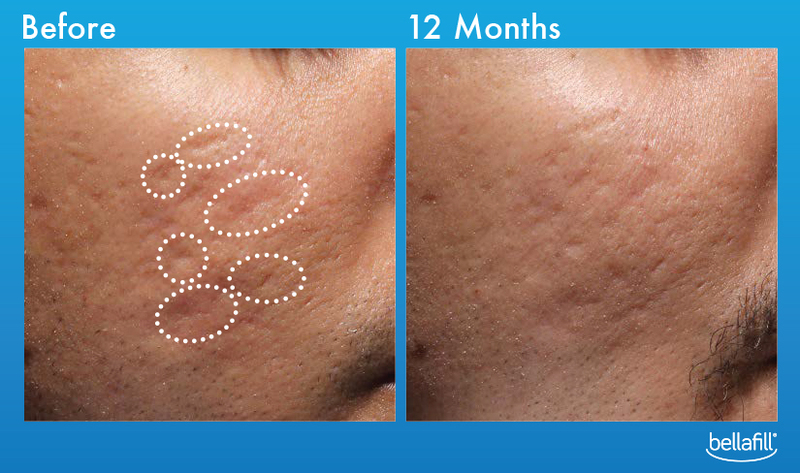 In a clinical study on acne scarring, Bellafill® remained safe and effective for patients through twelve months*.